This entry was posted on Thursday, February 19th, 2009 at 1:42 am	and is filed under Mozilla, Tinderbox. You can follow any responses to this entry through the RSS 2.0 feed. Both comments and pings are currently closed. My read of the situation (having worked on it in lives-previous-to-Mozilla, and judging solely on the complaints I see expressed herein) is the number of developers working on the project has increased the rate of change on the code base to the point where continuous integration of a centralized repo isn’t providing necessary information fast enough. More tooling and optimizing the build and continuous integration process provides increasingly diminishing returns wrt investment in it (especially in an area that is constantly changing, due to the product itself changing). Not to say there isn’t room for improvement, but a better gain would likely be made in changing in the development and integration methodology. Having said that, I’d also wager such a discussion would be DoA, because of resistance to change in the checkin process, which would add some amount of overhead, remove some amount of individual developer control, and make others responsible for getting changes checked in. It also requires more buy in and support from cross-functional parties, which… takes more effort than throwing people at (re)writing tools. Ironically, distributed version control would support such a model quite handily, but it would require getting away from the mindset of “mozilla-central” (a name that betrays the fact that its use is a centralized source code repository on top of a decentralized version control system). You might ask some of your old Mudder classmates who do this how they solve[d] it for more developers, across more product lines, way more branches, juggling more shared code, and with a (*gasp! *) centralized version control system and DIDN’T have to rewrite tinderbox (which they use) and come up with four different websites presenting the same information to get it done. What would definitely increase my productivity is speeding up the tests. I do a lot of code-build-test cycles on my machine to make sure my patches don’t break anything. And I have to wait a long time for the tests to finish. And a lot of them are not reliable at all. 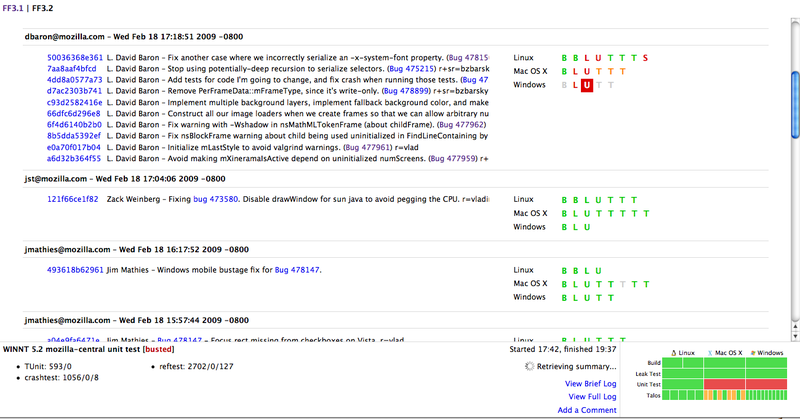 There are quite a lot of tests requiring focus on the browser window. Those tests usually fail when testing on a machine I am currently working on. Another must-have thing is tests on the try-server. This way critical patches can be tested on more architectures that I don’t have access to. The try-to-push method you mentioned also seems to be very interesting. But that really requires fast cycle-times to be effective. Echoing preed’s comments about getting away from mozilla-central, what about splitting more things out into their own repo? For example, the JS guys now do a lot of their work in a separate tracemonkey branch. If the /js dir was actually pulled in as part of the build process (or through some hg extension), how would that lighten the CI load? Are any other components/products amenable to this kind of treatment? For example, splitting up XULRunner and Firefox repositories? A case could be made that these are separate products, even though obviously there are a bunch of interdependencies. 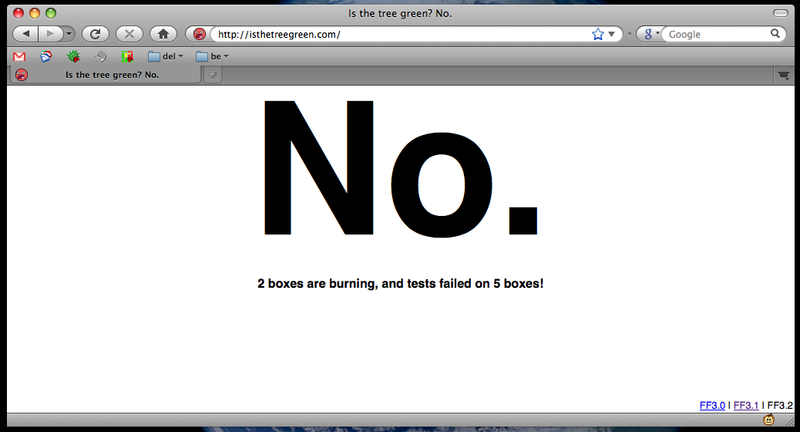 Try-to-push won’t actually guarantee that the tree is always green, because of nondeterministic test failures. I’m not going to cringe at comparisons with IMVU or others who don’t have the variety of test platforms or the number and complexity of tests that we do. FWIW, I posted in the newsgroup about infrastructure improvements that are not vapour ware but running on my build system. Just sayin’. Try: builds are flukes, Mozilla as a system is just too complex to rule out side effects just because patches merge. Mozilla as a system is just too complex to rule out side effects just because patches merge. Making people rebase manually even when patches touch different files does not solve this problem. It just shifts the blame when two patches interact badly. 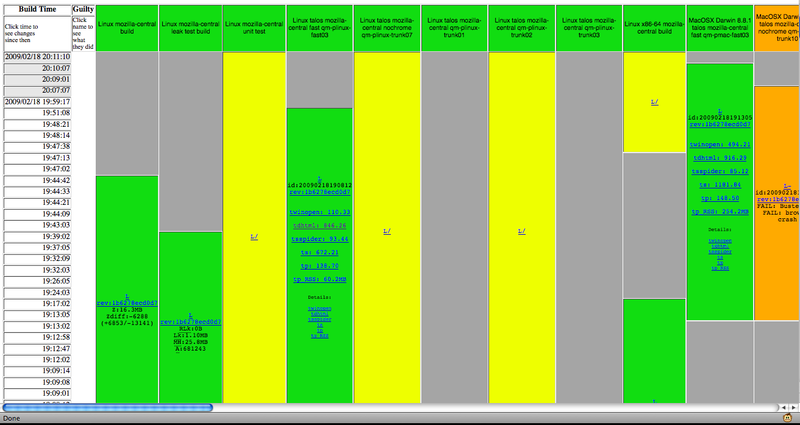 “Then it is always ok to pull or push, because mozilla-central is always green. ” Well, that’s only half the truth, as tryservers aren’t testing all uses of the Mozilla tree. There’s platforms and applications using mozilla-central as a base that might actually have failures Fennec, Thunderbird, SeaMonkey, and whatever else will probably never all be covered by try setups. And then, I fail to see how the try-to-push setup is much different than the current setup other than the tree you pull is always green for Firefox tier-1 platforms. If one tried push fails and another slightly later pushed one doesn, I don’t think it’ll be trivial to automatically sort that out without breaking the flow of patches into the repo, if automatically resolving it is possible at all. Nice post. I’ll elaborate on a few key differences between development at IMVU and development at Mozilla. BTW, we only have two types of builds: red and green. If there’s something you care about, make regressions break the build. Build with -Werror too. Heck, it’s crazy to me that reviewers spend their time nitting on style, when you could automate that and just make style regressions break the build. In short, keep finding and removing waste in your development processes. In these comments I hear an undercurrent of “wah wah testing mozilla is hard”, but if you keep pushing on it, it gets easier and easier. IMVU’s got PHP tests, perl tests, Flash tests, client acceptance tests, unit tests, integration with third-party services, integration with our own services, Python tests, C++ tests, assembly tests, selenium tests against internet explorer, selenium tests against firefox, various performance tests (augmented by reporting from the field) and some that I’m probably forgetting. You obviously can’t do all of that overnight, but if you keep improving the situation, it will get better. BTW, you may need hundreds of build machines to get a 10-minute turnaround on testing your entire suite, but that’s doable too. Three years ago, we had two machines and hardly any tests. Now we have 40-50 and piles of tests. @Chad: right on! you hiring? everybody owes it to themselves to read up on the whole Lean Kanban For Software thing, perhaps.